Market Intelligence: We tour current inventory daily and actively preview homes for our clients to ensure that the properties we show our buyers and the homes used as comparable sales in our pricing analysis are the most current and relevant to their needs. In doing so, we not only save our clients’ time by doing the heavy lifting for them but we are able to easily identify the subtle nuances of core Seattle neighborhoods and understand how these can impact property values from street to street. This requires the human touch that can’t be replicated by simply reviewing online photos or relying on a computer generated algorithm. Process Management: Buying and selling real estate is multi-faceted and fast paced. We effectively communicate with our clients every step of the way and manage relationships between critical parties like loan officers, escrow closers, title officers, appraisers and other agents. Our increased level of involvement and regular status updates provides peace of mind for our clients and minimizes any worry regarding the details of their transaction. Negotiations: Negotiating the best price and terms for our clients requires finesse and is where we excel. We understand when a situation requires a firm stance and when showing flexibility will produce the outcome our clients expect. Our buyer clients write more winning offers which means they spend less time actively looking for homes and less money on inspections and other costs of doing business. Our sellers reap the rewards of a carefully crafted pricing strategy that balances market demand, risk and the characteristics of both their home and ideal buyer profile – resulting in higher sales prices and a shorter amount of time on the market. Technical Expertise: As agents with significant experience dealing with land acquisition and new construction homes, we understand construction methods and materials, are able to analyze make strategic recommendations based on investment metrics, and understand how current land use and zoning requirements can impact property value. Resources: We embrace a collaborative environment, keeping every member of our team looped in on key details of our clients’ transactions to ensure we are considering all angles and scenarios throughout the process. 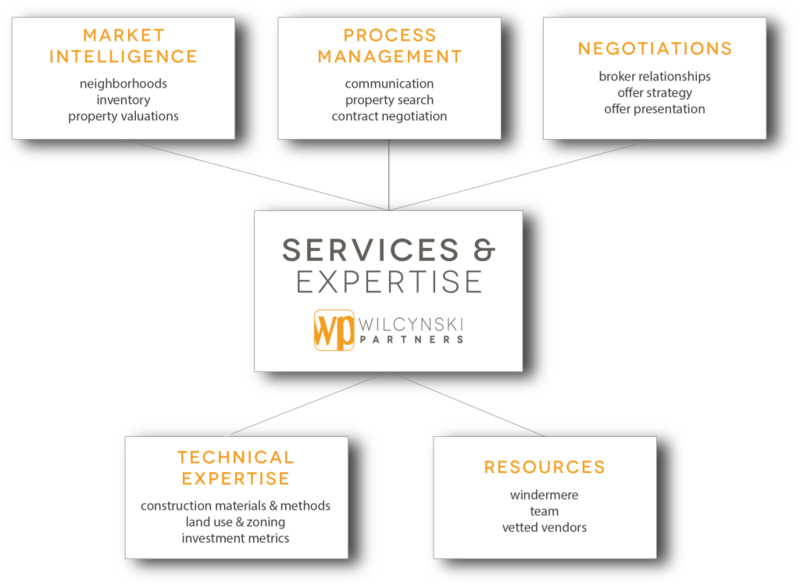 Operating under the Windermere brand, we have access to tools and systems that provide strategic insight and support, giving us the flexibility to move quickly and provide our clients with the most up to date and relevant information in our fast paced market.